I just got this adorable set of bibs from Savvy Baby. I love these bibs. They are so cute! They come in a set of four bibs each one a different design. This set has four different designs, a black & white polka dot, red & white chevron, yellow and white triangles, and gray with with arrows. They are really well made. The closure is a snap closure with three different sizes so you can easily choose the size that works best for your little one. They are a terry cloth on the inside of it, so it stops leaks and I use it a lot to wipe their face also when they are done eating. The stitching is really well done and reinforced. This set also comes with a really cute pacifier clip that’s red with white polka dots. Really well made and keeps baby from dropping that pacifier. These make adorable shower gifts as well. I got my set to give as a gift and I can’t wait for the person I got them for to open them and see their reaction. Super super cute and high quality. BEST BANDANA BIB WITH ADJUSTABLE SNAPS – Our 4 pack of baby drool bib bandanas, for girls and for boys, are fun and functional. Our high quality, unique unisex designs are the perfect fit for stylish boys or girls and will make other parents drool in jealousy! The perfect accessory for the savviest of babies! FREE PACIFIER LEASH INCLUDED! 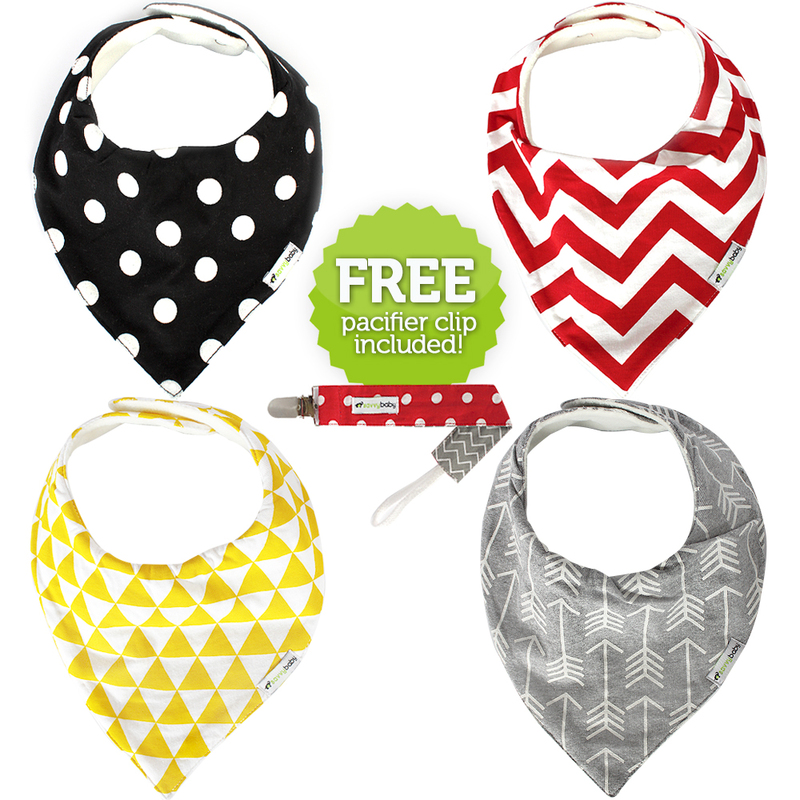 – Our 4 pack of baby drool bibs comes with a FREE pacifier holder! Not using a soothie pacifier? These bib clips are perfect for baby teething rings and can also be used as a baby blanket clip or a holder for stuffed animals. ADJUSTABLE NICKEL-FREE SNAPS FOR A DURABLE, UNIVERSAL FIT – Our snaps are adjustable so they can grow with your baby. Made of Nickel-Free Metal, No BPA, No Lead, No Phthalate, No Latex. They can be washed in the washing machine and AIR DRIED. SUPER ABSORBENT HIGH QUALITY BABY DROOL BIB – No need to sacrifice comfort, style, or functionality. Our bibs are made from 100% soft cotton with a super absorbent soft fleece backing so your baby can be both comfortable and stylish! Elevate your baby’s style with our functional and trendy designs for the perfect baby accessory! Makes a great baby shower gift too! LOVE IT OR YOUR MONEY BACK – At SavvyBaby, we work hard to give you the most trustworthy premium brand but we understand that sometimes new customers can be skeptical before adding us into their cart. That’s why every SavvyBaby product is backed by our 100% Hassle Free Worry Free Money Back Guarantee. If you are not happy with your Baby Drool Bib Bandanas for any reason, we will gladly refund your money, even if they are covered in drool!